Betting Basics for NASCAR written by: da1prophet At one point, betting on NASCAR auto racing was a ‘niche’ sport of limited appeal. Even as the sport grew in popularity betting interest lagged. In the past decade, that’s all changed–NASCAR betting has entered the realm of ‘major sports’. The good news is that there are more NASCAR betting opportunities at more sportsbooks than ever before. The bad news–the increased betting interest means that NASCAR betting odds are sharper than ever. At first glance, NASCAR racing looks very chaotic and arbitrary. Nothing could be further from the truth–the sport is extremely complex and trying to bet NASCAR without some level of understanding of these intricacies is all but impossible. 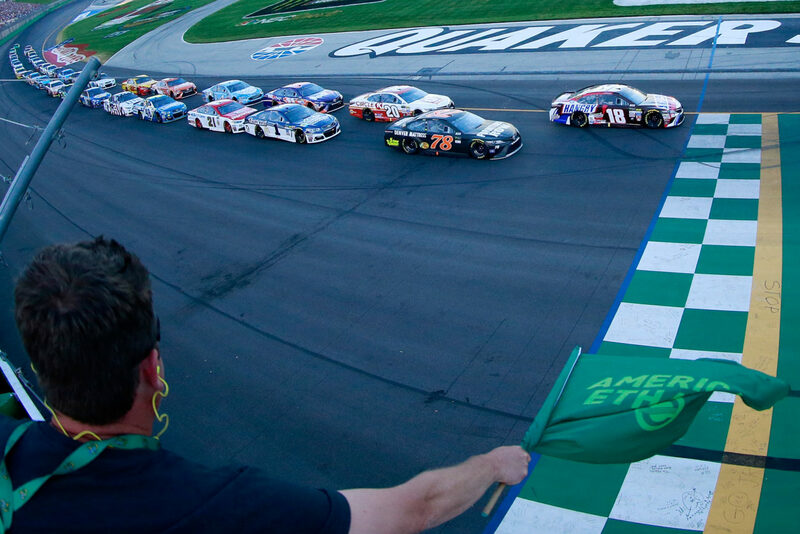 In this article, we’ll discuss the basics of NASCAR betting and look at the different bet types that you’ll encounter. Understanding a sport is only half the battle–just as important is understanding how to bet on a sport. There’s a reason that just being an ‘expert’ in a specific sport isn’t a ticket to riches at the sportsbook. It’s the same reason understanding a particular industry won’t in itself make you a fortune in the stock market. Understanding the mechanics of betting in general and specific to each sport is just as essential–if not more so–than a sound grasp of the sport itself. For that reason, it’s essential to learn the ins and outs of *how* to bet on NASCAR before moving on to specific handicapping techniques. There are several ways to bet on NASCAR racing, but the most common are ‘to win’ wagers, matchups bets and finish position bets. Some sportsbooks also offer creative proposition wagers that can also offer good betting value. Fantasy racing is very popular as well, and there’s likely more ‘overlap’ between fantasy racing and NASCAR betting than any other sport. That’s because the goal of both is identical–figuring out who will win the race and/or where a certain driver will finish in the field. The most basic type of NASCAR bet is the ‘to win’ wager. Some sportsbooks might call these ‘race futures’ because they employ a format similar to season-long futures betting. If you’ve ever bet on a golf tournament, you’ll be very familiar with this type of NASCAR betting. The linesmaker sets odds for every driver in the race, and the bettor has to pick a winner and bet accordingly. The more successful, popular or ‘in form’ drivers are at the shortest odds while rookies, also-rans and past their prime veterans are at longer odds. Some sportsbooks will group the lower tier of drivers into a ‘Field’ betting interest. Other books will quote odds on every driver, posting prices of +10000 or higher for some drivers. As always, odds vary from one sports book to another so shop around to find the best price. Selecting a winner is the first part of making a ‘to win’ wager but more important is finding a competitive driver at a price that makes him a good betting value. It’s not as easy as betting on the top drivers like Jimmie Johnson or Kevin Harvick every week. At the same time, a driver isn’t necessarily a ‘good value’ just because he’s got a big price attached. NASCAR is a very ‘top heavy’ sport in terms of success–a group of elite teams win the majority of the races. A lower tier driver may be +10000 on the betting board but have 100,000 to 1 ‘true odds’ of winning making him a bad value. Most bettors will bet several drivers ‘to win’ at prices that will produce a profit if any one of them emerge victorious. The matchup wager is the other common NASCAR bet and the one that attracts the majority of ‘sharp’ action on the sport. It’s just like a matchup wager in golf–the bookmaker quotes prices on a pair of drivers in each matchup and the bettor picks which one will finish higher. Usually, matchup wagers pair drivers at similar, competitive levels–top drivers against top drivers, mid-tier against mid-tier and so forth. Sometimes they’ll post a matchup between an elite driver and an also ran and price it accordingly. In some cases, matchups will have a ‘theme’ like drivers from the same team paired in a wager. Once again, it’s not as easy as just picking the ‘better driver’ and betting accordingly. NASCAR drivers are notoriously streaky so you might be better off betting a driver in better form over a higher profile driver struggling to win races. Every track on the NASCAR circuit poses unique challenges, and some drivers are better on certain tracks than others. It’s not much different than handicapping any other sport–a bettor evaluates short-term form, long term success and factors in the situational components. With this information, he measures a driver’s chances of finishing ahead of his ‘opponent’ against his price. If he finds the ‘value side’ more often than not, he’ll enjoy a profitable NASCAR betting season. This finish position bet is essentially a ‘matchup wager’ in a different package. Over the past decade, it’s grown in popularity and is now easy to find at any decent sports book in Nevada or offshore. The linesmaker assigns each driver a finish position and quotes odds for finishing ‘Over’ or ‘Under’ this number. It’s that simple but requires a similar handicapping process to the matchup wager. The bettor evaluates short and long term form, a driver’s history of success at a specific track and his ‘average finish’ statistics. It’s also important to remember that finishing higher in the field will result in a *lower* finish position, not a higher one. It’s somewhat counterintuitive to bet the ‘Under’ for a better performance instead of the ‘Over’ but don’t forget and make the wrong bet! You’ll often find proposition wagers on races, especially at ‘marquee events’ like the Daytona 500. Proposition wagers may involve over/under the number of caution flags, number of cars on the ‘lead lap’ at the end of the race, average speed, and countless other statistical metrics. One of the great things about NASCAR betting is that there is current season and past performance statistical data on just about everything. No matter how unusual a prop bet may sound, there’s likely a way to handicap it effectively.